Amazing value IN DOWNTOWN SLO! This is a rare opportunity to own a 2-bedroom plus bonus room, 1-bath Manufactured Home in a great location. Storage shed on cement pad with electricity included. Gated access to overflow parking on street behind property. Close to everything with views of the hills. Tired of renting? this is your opportunity to own in SLO. With new tile floors throughout including bonus room, kitchen countertops, backsplash and refaced cabinets, new kitchen sink/garbage disposal, new textured walls/paint/baseboards/crown molding, new carpet in west side bedroom. 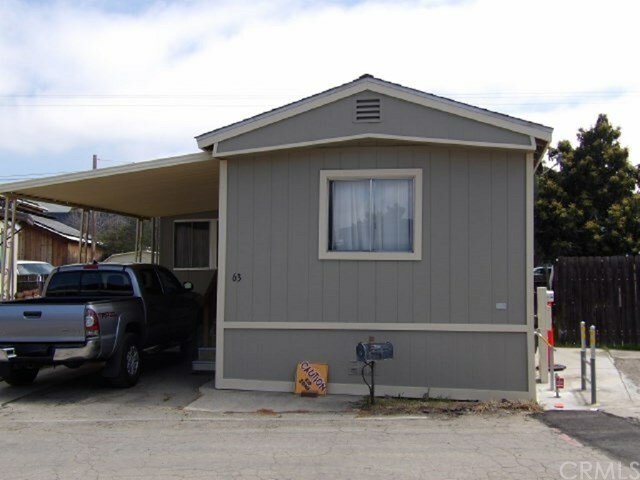 Village MobileHome Park is being renovated now is the time to buy while you can. This Home is on one of the largest lots. This is cute as can be and a fantastic deal. Call now before itâs gone it wonât last long. Directions: Higuera St to South St. South Peak AKA Village MobileHome Park is on South side of Higuera. As you enter park take first left and MH is on The left side of street.